When I was a kid, I didn't snore. But as I got older (and gained a little weight) I followed in my father's footsteps to become a very loud snorer. I would keep friends awake on ski trips, relatives awake on family reunions when we slept in the same room, stuff like that. So I started looking into whether it was possible to fix my snoring. The short answer is "yes with surgery", the long answer is that there are a whole host of surgical procedures that vary from being very simple and safe (and not very effective) up to relatively complex and invasive with potential side effects (and EXTREMELY effective). Snoring is caused when the airway relaxes during sleep, almost closes shut, and loose tissue in the throat flaps around during breathing. The smaller the airway, or the more relaxed it becomes, the more likely it is that you snore. If a person gains weight, some of this weight is added to the inside of the throat and contributes to snoring. If you drink alcohol before bed, the throat tends to relax more and the snoring is worse. And the older you get, the worse your snoring becomes as your muscles in your throat aren't as firm anymore. Also, if your nose is not completely clear and open (if you have allergies, a deviated septum, or are sick) then you tend to breath through your mouth and this makes snoring worse. A note about sleep apnea: "Sleep Apnea" is when your throat becomes so relaxed that it closes and you stop breathing while sleeping. You would die from this, except that your body has a built in defense mechanism and "wakes up" enough to take a deep gulping breath of air. Doctors consider you "normal" if you have between 0 and 5 "apnea events" per hour, and have "mild sleep apnea" with 6 - 10 events per hour. Some patients have 70 or more events per hour, and are walking zombies during the day from waking up all night long, and can die from sleep apnea. Heavy snoring is one indicator of sleep apnea, and many people that are big snorers do have sleep apnea. It makes a lot of sense that people with smaller, collapsible airways both snore, and get the air shut off when they sleep. I started with what is called "Somnoplasty" which is a really mild procedure which takes about 2 minutes under local anesthetic. The doctors pretend it is "magic radio frequency" but in reality the idea is that they put a needle into the tissue that is too large in your throat and "burn" a small area inside (not on the surface). Over the next few weeks that burned area is absorbed by your body, making the tissue smaller and firmer. Here is a time lapse diagram of the procedure. Click here to see an QT video of the procedure. You do the somnoplasty 2 - 4 times spread out over a 4 month period, it costs about 500 dollars each time, each time shrinking the tissue more and more. It is extremely safe, no side effects, and minimal discomfort. I flew to Colorado on a business trip the same day I had the procedure, it is that mild. Unfortunately, it did not cure my snoring. In LAUP, the doctor hits the Uvula and sides of the throat with a laser which scars and tightens the tissue wherever the laser hits. LAUP is commonly done 3 - 5 times spread out over a few months time, each time reducing snoring more and more. To see a picture of my friend's throat immediately after his 1st LAUP treatment, click here. (WARNING: very graphic, not for the squeamish). Some of the sensors include little sensors in my nose to detect when I'm breathing through my nose, a microphone strapped to my throat to detect snoring, and a oxygen level meter to detect if my blood has enough oxygen strapped to my finger. There are also electrodes glued to my head, and above my eyelids to notice when I'm in REM sleep (Rapid Eye Movement). There are electrodes taped to my legs to see if they move around at night. The results of the test was that I have "upper airway resistance syndrome" (my nose is always kind of blocked up because of large turbinates) and the back of my tongue is too large and falls back to obstruct the airway. In other words, I snore really loudly. 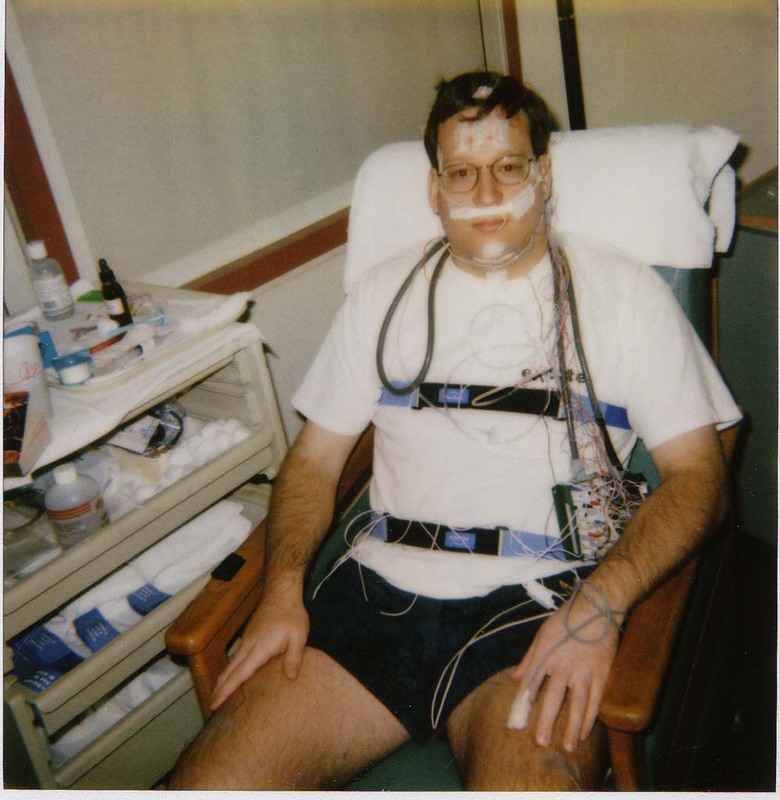 :-) I was also diagnosed with mild sleep apnea. The doctors also told me they expected to see me back in ten years with serious sleep apnea as I got older. So the next stage was to go to one of the best oral surgeons, Dr. Robert Riley. Click here to see his practice and website. He was recommended very highly by all the doctors I talked with in the Stanford Sleep Clinic. Dr. Riley presented me with several options, from "do nothing at all" to "try some minor surgical procedures and see if they cure me", all the way up to "cure the sleep apnea and snoring with one pretty invasive surgery". I decided to do the invasive surgery. Top of Airway - UPPP (Uvulopalatopharyngoplasty) which is much like the LAUP described above but is more invasive. It has the advantage over LAUP that it can be done all at once instead of LAUP's 3 - 5 separate visits over several months. Sides of Airway - Tonsillectomy - The less material blocking the throat the better, so my tonsils were taken out. Bottom of Airway - Genioglossus Tongue Advancement - The back of my tongue is large and falls back to obstruct the airway. This procedure pulls the back of the tongue forward and prevents it from falling backward. Because of the invasiveness of this surgery, I spent the night in the hospital so they could monitor me. Now, if you want to read more about these three procedures, and if you don't mind seeing GRAPHIC pictures which might disturb you, you can click here to see pictures of my throat post-surgery, and diagrams and explanations of what was done.